DevOps, Platform-as-a-Service, containers, and continuous integration and delivery (CI/CD) methods now let organizations create and manage these modular systems on an unprecedented scale. But those that refactor monolithic apps experience widely varying degrees of success, and establishing microservices architecture could prove to be a significant investment without an immediate return. Discover in this paper how to achieve success with microservices, by gradually refactoring your apps. 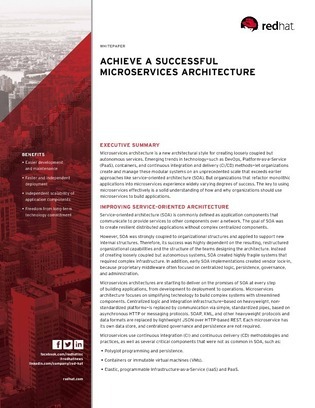 Read on to build your microservices foundation to improve upon service-oriented architecture, and benefit from easier development and maintenance, independent scalability of application components, and more.